Save the Date: 13th April 2019 – STEAMhouse, Digbeth. This is a movement which was launched in Europe and is now becoming global. On Saturday 13th April we want to welcome 75 people: public administrators, members from the civic world and business, to join us at STEAMhouse in Digbeth from 11.00-4.00 to start it rolling in Birmingham. We’re planning an upbeat day sharing examples, short and snappy, of how others have done things in new ways. 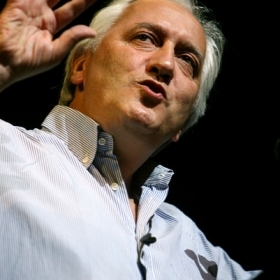 Charles Landry will talk about why Creative Bureaucracy is an idea whose time has come and we’ll have moderated panels discussing great ideas that somehow got lost on the way as well as honouring some hidden heroes/heroines in the city. But we need you to help us make Creative Bureaucracy a reality in Birmingham. 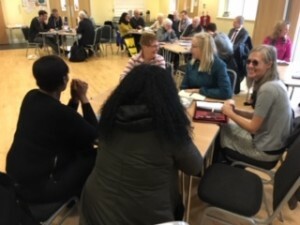 Earlier this year Birmingham Partners agreed to carry out some research to reflect the interconnectedness and resilience of Birmingham people. In addition to the many stories covered in the news about the city, we felt something was lacking in terms of how Brummies live their lives: the ways they connect with others in and across communities, the ways in which they solve problems and support each other, the great examples of humanity on display. With a major city there is never going to be just one narrative which sums it up. But the ‘interconnectedness project’ offers a snapshot which adds richness to the other narratives. South of the City “Share, Learn, Do” event – 24 January at Weoley Hill Hall – report coming soon. On 14th January, Birmingham Partners and the Witton Lodge Community Association held a North Brum ‘share, learn, do’ meeting from 10-12. 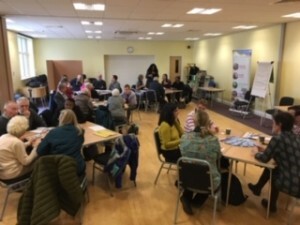 26 people from a variety of organisations, many of whom representing more than one group, turned up bringing great energy and information to share about problem solving in the city. On each table people then shared their experience of how they set up, organised, met obstacles and how they overcame some and identified others they hadn’t. We then shared around the room different examples of where people needed advice and how they’d resolved issues. Reflecting on the meeting people said they’d found it useful to meet others and realise they’re ‘not on their own’, agreed to exchange details and contacts, wanted a follow up meeting and perhaps some themes so they could come/ invite others knowing a particular aspect was being tackled. This meeting was supported by the city council – as one of the Birmingham Partners – as part of their Community Cohesion strategy. A similar event is taking place on the 24th January in the south of the city. We’re planning them in the East and West too. We’re an informal group of people from different sectors of the city, wanting to link together for the betterment of Birmingham. Get involved today. Birmingham Partners is an association of groups and organisations connecting to help improve the city. We formed in 2014 and have a facilitation group which meets monthly to agree events and a general direction. You can find minutes from those meetings on this website, as well as more information about our plans. We’re open to anyone who wants to sign up to our aim – to connect for a better Birmingham. In this amazing city there are already many great networks of people, organisations and communities of interest. Birmingham Partners aim to put those networks in touch with each other, to create new links to share knowledge and help problem-solve across the city. We think bringing together people from public, private and voluntary sectors, academics, experts and representatives from all communities will open doors, provide answers and create new opportunities. We will be focussing on very local practical issues as well as city-wide, deep-rooted challenges. We want to involve as many different people in our events as possible, so we will host them in the north, south, east and west of Birmingham, not just the city centre. Our watch words are ‘share, learn, do’.